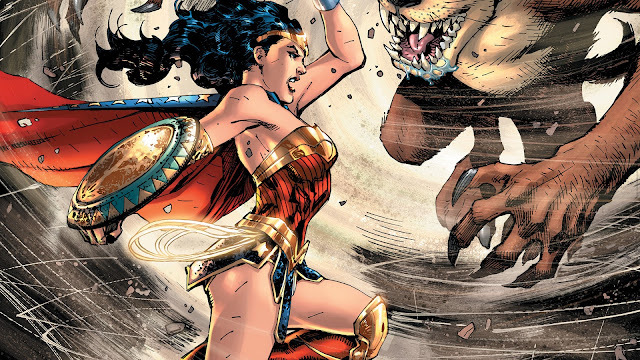 With Wonder Woman and The Tasmanian Devil we possibly get the oddest combination from these cross-over’s. With Taz’s speech usually consisting of gibberish as he runs around causing havoc I struggled to really think of a way that this combination could work. So does the issue pleasantly surprise or does it end up similar to Taz himself; a bunch of gibberish and havoc? Find out after the jump. We first jump in with Diana in a jungle about to face off against the shadow of Taz before we jump in time to how exactly we got here. To me personally, that’s always a great sign for good story coming up. Because if you can’t pull people in with the actual story, just jump ahead to a more interesting part. We jump back years where it seems Diana is amid some sort of puberty ceremony that entails a lot of challenges as she is chased through a labyrinth where she jumps through a portal and finds herself face to face with the Tasmanian Devil as he contemplates eating her. Around this point I actually came around quite a bit on the idea of the issue as using Taz as a mythical creature in the cavalcade of Wonder Woman’s mythos works quite well. Instead of fending off the devil Diana proceeds to lull Taz into a slumber with music which helps her escape. The book starts off fine enough with winning me over, but it’s shortly after this where it goes downhill in my eyes. We now jump ahead in time while still being earlier than the opening scene. Themyscira is amid a ceremony when they are attacked by Cerse equipped with a Medusa style medallion that slowly (very slowly) turns all the islands inhabitants to stone. 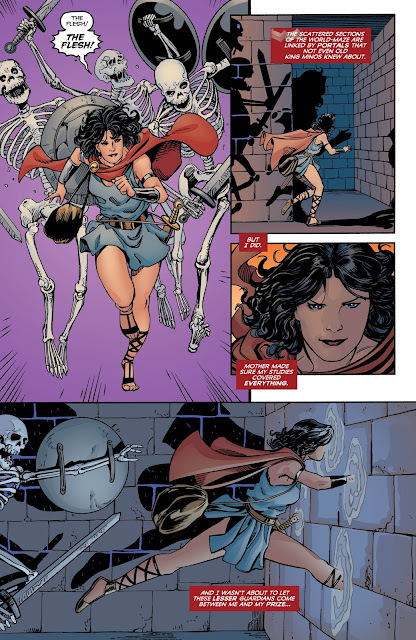 But not fast enough before Diana is able to escape with a hint to help from Hippolyta. This is honestly where the story becomes convoluted and a little strange to follow. Diana realizes to counter Cerse’s amulet she needs a medallion on the belt of the Minotaur in the Labyrinth and she things to get Taz for help from this who does only because he wants to hear the music again. Then when it all wraps up I don’t even think the medallion from the Minotaur is ever even used. Once again we get a back-up that pretty much comes across better than the main issue, though it doesn’t really come as a cross-over in that it’s more of a traditional story told through Looney Tunes rather than being a Looney Tunes/DC cross-over. Seeing all the characters placed in the different roles is fun and the story is entertaining enough. Overall this issue makes me believe this cross-over could work, but it ends up being too convoluted and wrapped together in a mess of unneeded circumstances that seem to end up not even mattering. With a back-up that ends up being more enjoyable but in and of itself a little contrary to the premise of the cross-overs, overall this package is just not really worth it. 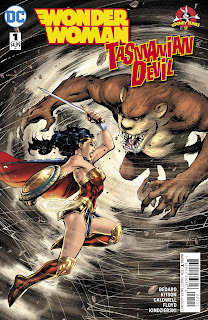 The premise of the Tasmanian Devil being in the Wonder Woman world is sold well enough but the issue lacks overall due to a convoluted and messy story. 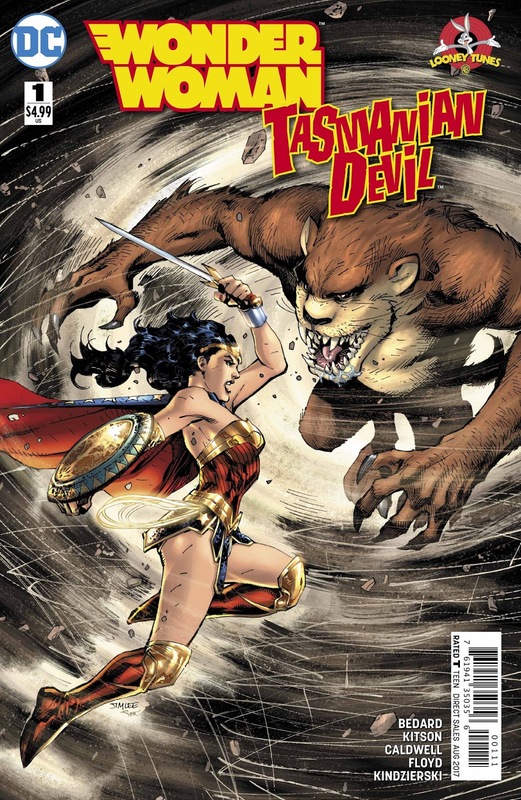 I didn't hate it this much, the main story was just sort of a mediocre Wonder Woman story that had almost nothing to do with the Tasmanian Devil. The back-up was probably the lamest I've seen so far in this event. So yeah, still not worth the trouble. I liked the idea of how Tasmanian Devil is brought into the WW world, but basically everything else done afterward is just dumb. I need to sadly re-read it. I really don't even think the talisman they went for was even used in the end. She wraps her lasso around Cerse medallion to break everyone from the curse. So what was even the point of the Menotaur's amulet and getting Taz to help in the first place? !